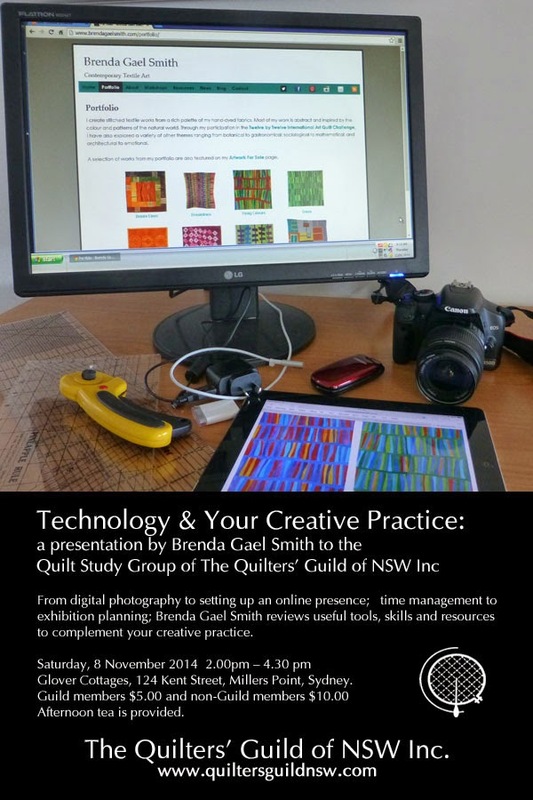 On Saturday the 8th of November, noted contemporary textile artist Brenda Gael Smith will give a talk for the Quilt Study Group of NSW about the useful tools, skills and resources she has discovered that have helped her in her quilting practice. Brenda's talk will range from digital photography to setting up an online presence, time management and exhibition planning. Brenda's work with the international Twelve by Twelve group and her most recent work curating The Living Colour! Exhibition (which is currently touring Australia and New Zealand and will go to USA next year) has provided her with extensive experience and advice that we can all benefit from. Be prepared to share examples of how you have used your digital camera, computer, tablet, and/or smart phone to support your creativity or productivity when making quilts. The talk will be given at the new QSG of NSW venue - The Glover Cottages at 124 Kent Street, Millers Point, Sydney. Quilters' Guild of NSW members pay $5.00 and non-Guild members $10.00 to attend visit. Afternoon tea is provided. Please bring along any quilts you have made or are making that have involved the use of technical resources such as digital photography, quilting or graphical software and share them with us.